Good morning everyone. We have had an awesome week exploring nature and photography with master naturalist, Erika Carlson-Rhile and master photographer JimDugan.com. More to follow…. Posted in camden windjammer cruises sailing vacations on June 30, 2012 by Capt. Barry. Good morning everyone.Gonna be another steamer here in Maine with temps clear up into the 70s. Let’s go swimming’! We have a guest aboard who was quite concerned about the forecast for the week and called us last Sunday to see if they could switch cruises. Of course, we couldn’t accommodate that. The food was bought, the ship was ready. We encouraged him with the promise that things wouldn’t be as bad as the forecast might predict. Amazingly, we were right. I had to mark the calendar as that doesn’t happen often in my world. Anyhoo, we have enjoyed a rather pleasant week with a few showers but our days have been by and large quite pleasant, especially compared to some of the hazy, hot and humid forecasts we have heard from the shore. For all you folks who weighed in on the missing element: Yes, no guests, no crew, no kidding! And, yes, she is underway, making way! Capt. Wells along with guests and crew of the Lewis R. French did a masterful job of hiding. There was not a soul to be seen or heard. Darn but I wish I had thought of that. I believe the art of the practical joke has been set to a higher level without harm or injury or embarrassment to anyone. Mary Day’s guests and crew got quite a laugh out of that one. Thank you so much to Capt. Wells, guests and crew for making our day complete. And of course, the Lewis R. French is such a handy sailor herself that she kept her track all the way with all the ease of the graceful lady she is. Three cheers for the Lewis R French! Posted in camden windjammer cruises sailing vacations on June 29, 2012 by Capt. Barry. Good morning everyone. Today I have a riddle. Like many of our natural/cultural history cruises this has been a week of adventure. We have been over the horizon in several directions. The more folks return the more I feel the need to push the envelope. Early in the season this is easier because there are so few boats out here. It has been a chilly week where we have been but such a small sacrifice for such big adventure. And for folks who left the 90s onshore the respite is welcome. So based on the the two images here can you guess where we have been. One place we get to a couple times a year because of its wildlife activity. The other place, very close by, is an anchorage I have never visited in the last thirty years. The north wind and clear weather were perfect for both places, one on the way to the other. We did discover one thing. 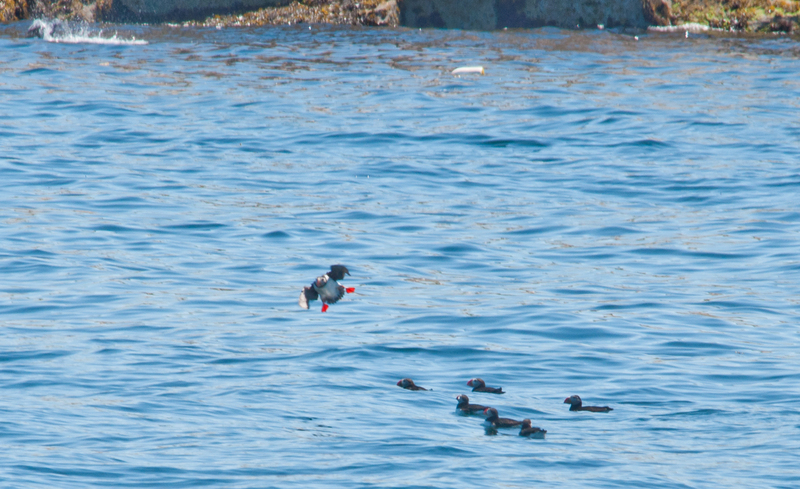 At this time of year puffins are not nearly as numerous in the late afternoon as they are mid-morning. Well, enough hints. Any guesses? Posted in camden windjammer cruises sailing vacations on June 16, 2012 by Capt. Barry. Good morning everyone. 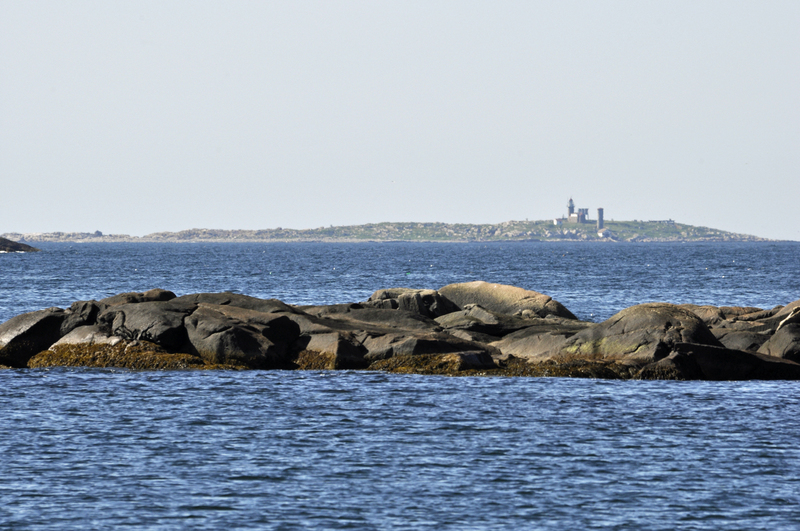 We had a spectacular sail yesterday, our first day of the season‚Äôs first 6 day cruise, Puffins and the War of 1812. 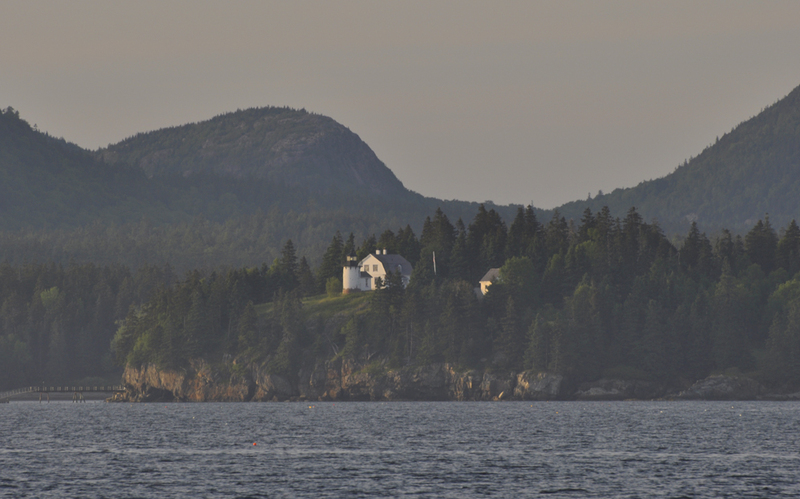 By days end we had 50 miles under our keel since departing from Camden and were treated to a beautiful sunset over Acadia National Park and Mt Desert. 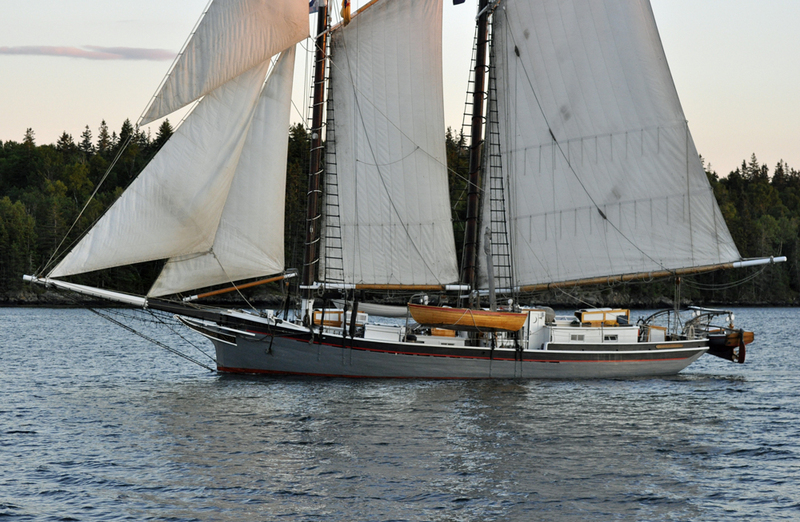 Along the way we had the pleasure of sailing close alongside the schooner Heritage. The sun light dancing on the water and graceful sheer of her rail kept all the cameras aboard Mary Day quite busy while we circumnavigated her port and starboard sides, stern and bow. They had their cameras pointing our way as well. I hope we get a chance to exchange images sometime. 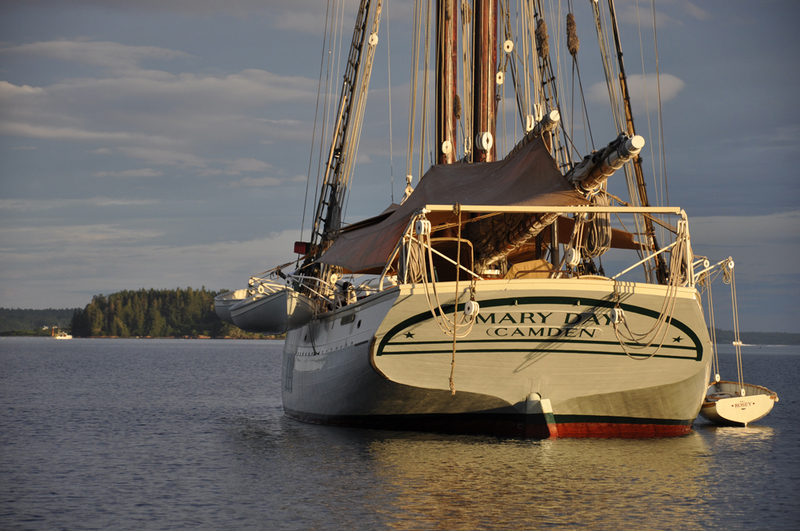 Anchored here at Little Cranberry Island, the small community of Islesford calls to be explored. I have been here many many times over the past 30 years but I never get enough. It feels like home to be anchored here. Guests are heading ashore right now to hike to the back beach where the tide washed-stones sing their clickety clack song to the waves. The small artists shops are not quite ready for our early arrival. I encouraged folks to visit the small church where light filtering through stained glass warms the soul. A skirmish occurred here in Hadlock Cove during the War of 1812 between the US and British. I have ordered the crew to take to the small boats to allow a reenactment for the guests, water balloons for armament. I am mindful of how blessed we are to be in this beautiful place with such good company and a view from the office window that can‚Äôt be beat. 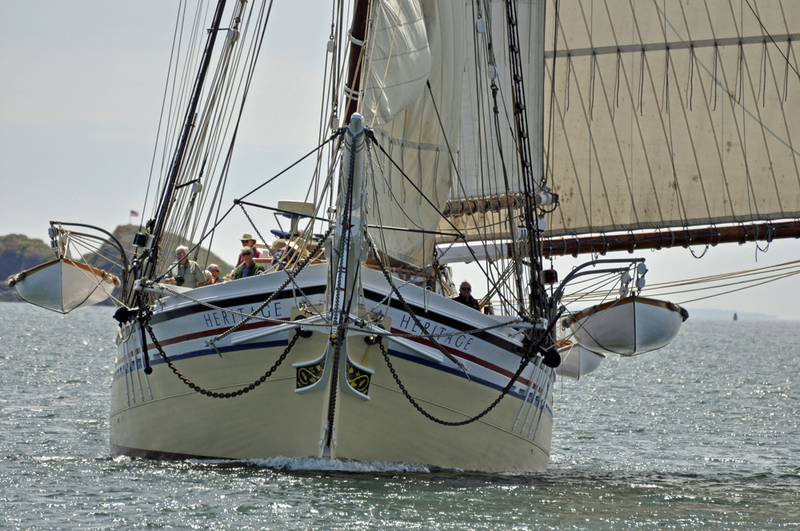 Posted in camden windjammer cruises sailing vacations, maine nature cruises, nature tours in maine, war of 1812 and tagged maine schooner cruises, maine vacations, maine windjammers, schooners on June 12, 2012 by Capt. Barry.